Unemployment is scary when it happens, and it happens to a lot of us. 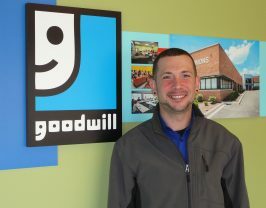 Wesley came to Goodwill with all the anxiety most of us would feel after losing a job. In his case the closure of Bergner’s left him unemployed. With Goodwill’s help he started where most people do, by updating his resume. Wesley highlighted his military experience along with his work in loss prevention and security. He also sharpened his interview skills and used Goodwill Commons’ computer lab to apply for jobs online. When someone is unemployed the bills pile up fast and that’s what happened to Wesley. Goodwill was able to help him with paying for his license renewal, which ensured he could make it to job interviews. After several weeks and many interviews, Wesley landed a job with Office Depot as their operations manager for both Peoria locations. Again, he needed some help with expenses and Goodwill was there by supplying him with steel toed boots, dress pants and dress shirts. Today Wesley is employed and has gained even more than a paycheck, he has the self-respect that comes with employment. When you donate to Goodwill, you really are changing lives.